Jill Harry was born and raised in the Cranberry area where she attended Christian Life Academy and Cranberry High School before moving on to Grove City College. After graduating, she made her way back to Venango County to be close to family. Now, she is an active member of the community and making the most of small town life. “One of the things I love about Franklin is the strong sense of community. People step up to make things happen and keep the city vibrant,” Jill said. Jill and her two sons Keller, 13, and Kyel, 11, live in the Rocky Grove neighborhood. Jill said she loves living in Franklin because it is such an easily walkable community. She can go out to eat, go shopping, or check out any of the numerous events in town without needing to drive. "I was going to tell you my favorite Franklin festival, but then I couldn't pick between all the great events. Taste of Franklin, Light Up Night, Applefest and Franklin on Ice are on our to do list every year," she said. Career-wise, Jill has been able to find two jobs she loves without having to leave the area. She was able to truly get to know the community working for The Derrick Publishing Company for 12 years. Now she serves the community through her work as Press Officer for PennDOT District 1 in Oil City. The term “Spare time” isn’t used often in their household. 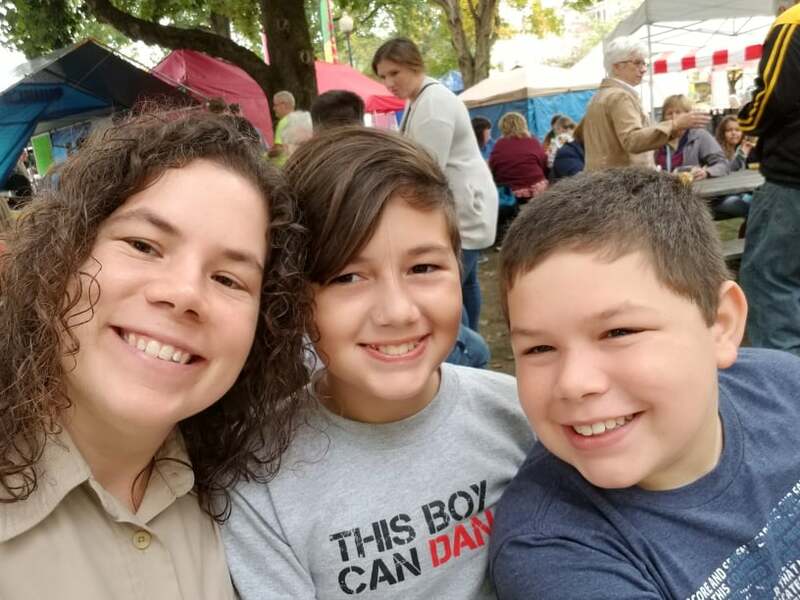 Between dance lessons, theater practices, guitar lessons, and Boy Scout meetings for the boys and Jill’s volunteer work with Cub Scout Pack 37, Relay for Life, Barrow-Civic Theatre, and Indiefest, the Harrys are always hopping. When she does have an opportunity to relax, Jill can be found hiking at Oil Creek State Park.